Yesterday, a number of drivers became stranded because they were not able to handle the icy and treacherous terrain on Dallas’ eastbound I-20. This ended up leading to a MASSIVE highway clog as traffic was deadened to a stand still. Fortunately for everybody there, the local Chisholm Trail Jeep Club was on the scene. 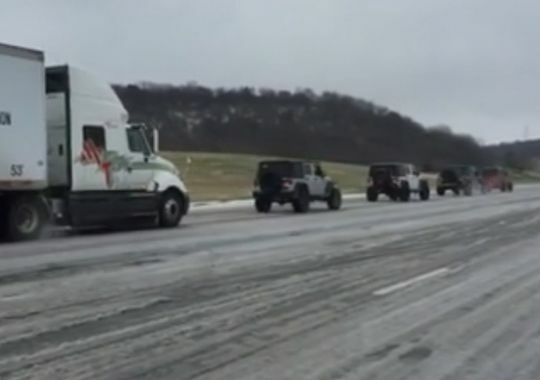 According to reports and amazing video footage, the Jeep owners belonging to the club began towing everything from compact cars to 18-wheelers. Even after helping clear the highway, club members said that they planned on staying through the night to help more drivers and make sure traffic is running smoothly. This entry was posted in Culture, Jeep and tagged Chisholm Trail Jeep Club, Dallas' eastbound I-20, Jeep owners, treacherous terrain. Bookmark the permalink.